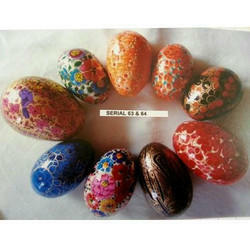 In order to meet excellent quality standards, we are supplying Wooden Eggs. We are amongst the most reputed names in the industry, offering Easter Wooden Eggs. We are engaged in offering an array of Hand Painted Easter Wooden Eggs to our prestigious clients, at reasonable prices. These items are fabricated using top-notch quality raw material and are designed by our team of skilled designers. Banking on our enriched industry experience, we are able to supply Wooden Eggs. Hand Painted Wooden Easter Eggs. 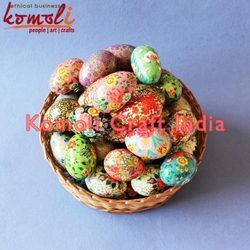 Hand Painted by the dexterous artisans of Kashmir, these wooden Easter Eggs come in various designs and sizes. Wood Wooden Easter Eggs, Size: 3"
From our wide consignment, we are affianced in supplying Duclan Wooden Egg. We are a top-notch organization, engaged in providing Wooden Eggs. Our reputed entity is engaged in supplying Wooden Eggs.